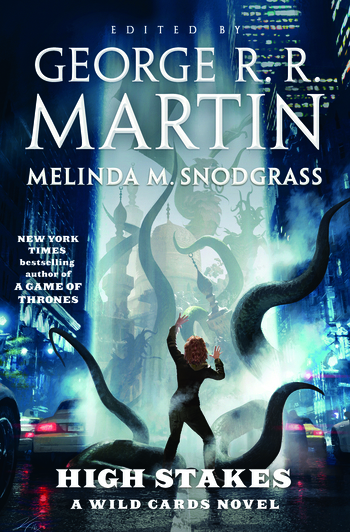 George R. R. Martin & Melinda M. Snodgrass, eds. Perfect for old fans and new readers alike, High Stakes (Wild Cards) delves deeper into the world of aces, jokers, and the hard-boiled men and women of the Fort Freak police precinct in a pulpy, page-turning novel of superheroics and Lovecraftian horror bu George R. R. Martin and Melinda M. Snodgrass. The Committee in New York sends a team of aces to investigate. One by one, each falls victim to evil forces--including the dark impulses within themselves. Only the perseverance of the most unlikely of heroes has a chance of saving the world before utter chaos erupts on Earth. This shared-universe science fiction series, created and edited since 1987 by New York Times #1 bestselling science fiction and fantasy author George R. R. Martin, now tells the story of a new generation of heroes, for long-time fans and new readers alike. GEORGE R. R. MARTIN is the author of the international bestselling A Song of Ice and Fire series. Martin has won the Hugo, Nebula, Bram Stoker, and World Fantasy Awards for his numerous novels and short stories. MELINDA M. SNODGRASS has worked on staff for numerous shows in Hollywood, including Star Trek: The Next Generation, and she has written pilots and feature films. In addition to being coeditor of the Wild Cards series, she also writes urban fantasy under the name Phillipa Bornikova.